I started to move the six amphibian pages to this directory in 2006! I really started on the directory in November of 2008. By 2010, there were 28 pages but I still had not finalized the frog directory. I finally did it!! After YEARS, I moved the links on the main page regarding amphibians to this directory on 7/3/10! Time for fireworks! So far, there are 28 amphibian pages in this section. 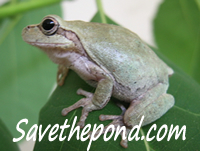 Here is a list of all the pages in the amphibian subdirectory. There are currently 28 pages in the amphibian subdirectory.